Join the discussion on our forums! Come discuss Finders Keepers over in our dedicated Finders Keepers discussion topic. Cannot discover Crackling Doom in Arena. Does anyone else think he looks like he's grabbing broccoli? A quick breakdown of what will be available from this card in the next expansion. I put together this simple jade N'Zoth shaman deck to try finders keepers and the card always served me well, too bad some of these cards are about to rotate and this deck won't be viable anymore, it was pretty funny to play. I think this card it's being underated, it saved me several times today giving me doomhammers and earth elementals when I needed them. It is underrated. It's a great card and can be very situational. You.. discover a card with Overload.. I dont think you have the right to mock him, the question was perfectly valid, you just read it wrong. He's bringing up the point that the Discover mechanic only allows you to disover cards from your own class (which is exactly what it has been in the time he posted it) For example, Jeweled Scarab can only discover 3 cost cards from your own class, not any other other. 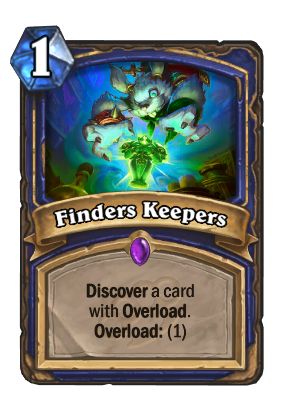 He's asking that since classes such as mage don't have any overload cards, and the discover mechanic only allows you to discover cards from your own class, how would the card work? Of course, since cards such as Lotus Agents and Kabal Courier were added, this answers his question -- On certain occasions, you can discover cards from other classes. But he posted this comment before these cards were in the game. Next time, why not be helpful instead of acting like a know-it-all? Sorry, I wasn't trying to mock him brother, and I also haven't noticed the date he posted his comment. S'all good. This is the Raven Idol of Shaman. It has beautiful synergy with Wicked Witch Doctor, Arcane Giant, Violet Teacher, Gadgetzan Auctioneer, etc. In my opinion it is probably even better than Raven Idol because overload cards are so cheap, so they lend themselves perfectly to the one insane "miracle" turn. I am excited to play it with the Witch Doctor. Decks built around her are already surprisingly good. And of course will also be great for control, to get more board clears.